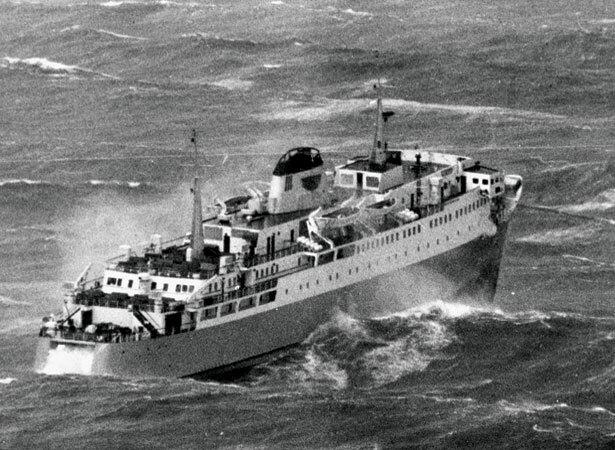 Few ships have had as much impact on New Zealand history as the Aramoana, the country’s first roll-on roll-off ferry, which entered service between Wellington and Picton in 1962. Cars and rail-freight wagons could now readily cross Cook Strait and be driven on and off the ferry at each end of the voyage. The GMV (‘government motor vessel’) Aramoana was the poster child for the Railways Department’s new Cook Strait ferry service. Its influence was immediate. In its last year of service, the Union Steam Ship Company’s former Wellington–Picton ferry Tamahine had carried 60,000 passengers, 11,000 cars and 14,000 tonnes of cargo. In its first year, the Aramoana carried 207,000 passengers, 46,000 cars and 181,000 tonnes of cargo. Since the 1960s, five other Cook Strait ferries have carried the ‘Ara’ prefix: Aranui, Arahanga, Aratika, Arahura and Aratere. For more than half a century these ships – and more recent successors and competitors – have formed a ‘floating bridge’, linking the North and South Islands’ road and rail networks in a truly national transport system. We have 1 biography, 14 articles, related to Picton ferry Aramoana enters service.